BELLRINGER: Mr. B. is finally here. Intoductions. We discuss and debrief to see how things are going. We review grades and missing work. THE REALLY BIG PROJECT, "The History of Your Favorite Thing Paper": should be completing their papers. This is due on WEDNESDAY, but we do not have class tomorrow, due to MAPS testing. PAPER OUTLINE: Make sure that you have all pieces included. Paragraph ONE: An EXCITING introduction regarding your TOPIC that explains WHAT IS IT? THIS SHOULD BE COMPLETED BY THE BELLRINGER AT THE START OF CLASS TODAY! Paragraph TWO: Creation of product/ company. Paragraphs THREE-FIVE (minimum): Explain at least three major changes that have occured with your product/ company since the founding. PUT THESE IN CHRONOLOGICAL ORDER! Paragraph SIX: Explain your product/ company today. Our Next Project: To prepare for our upcoming FORMS PROJECT, we discuss OPINIONS. You should ahve already completed the "Freshman Technology Opinion Survey." Our project is The Google Forms Project. Make sure that your questions pertain to classmates' OPINIONS regarding your FAVORITE THING from your paper last week. EMAIL your form to Mr. B. by clicking on the SEND button at the top of your form. DUE FRIDAY. MR. B. HAS BEEN CLEARED BY THE DOCTOR'S TO RETURN TO WORK ON MONDAY. YAY! BELLRINGER: To prepare for our upcoming FORMS PROJECT, please complete the "Freshman Technology Opinion Survey." HOW MUCH SHOULD YOU HAVE COMPLETED TODAY? By the end of class today, students should have completed most of their written paragraphs for their paper, including in-line citations and their sources page. BELLRINGER: GOOD NEWS! MR. B. IS PUSHING THE DEADLINE FOR THE FAVORITE THING PAPER BACK TO NEXT WEDNESDAY! YAY! Mr. B. did a ton of grading yesterday. Currently, there are FOUR STUDENTS that have passing grades in this class. PLEASE CHECK YOUR EMAIL at the start of class for a letter from Mr. B. outlining what your grades are and how you can fix them. SPEND TODAY IMPROVING YOUR GRADE IN THIS CLASS! Progress reports go out tomorrow morning! MAKE SURE TO EMAIL MR. B. ASKING FOR A REGRADE OF YOUR WORK, OTHERWISE, HE WILL NOT CHANGE YOUR GRADE! ALL WORK TODAY! NO DISRUPTIONS! The substitute is instructed to REMOVE any students from the classroom that are in any way disruptive or off task for today. WORK DAY: FIX YOUR MISSING OR FAILED WORK ON THE DRAW.IO DIAGRAM PROJECT AND THE GOOGLE GRAPHING PROJECT TODAY! BELLRINGER: We will complete the "Research Paper Checklist" at the start of class today, so that all students have a very clear idea of all of the things that need to be completed to receive a good grade on this project. ALL WORK TODAY! NO DISRUPTIONS! Ms. Donahue is instructed to REMOVE any students from the classroom that are in any way disruptive or off task for today. Unfortunately, after extensive testing, the doctors do not think that Mr. B. is ready to come back to work yet. He will be out this week, but WILL be back on Monday, the 22nd of April. You should have completed your FAVORITE THING DRAW.IO diagram and CLASS SCHEDULE. These should be saved in your FRESHMAN_TECHNOLOGY folder. You should have completed the research for your FAVORITE THING PAPER, including website references for your findings. You should have already researched the founding of your FAVORITE COMPANY, as well as three changes that have happened to the company and what the company is doing in the year 2019. ASSIGNMENT ONE: All students should be FINISHING UP WORK on The Google Graphing Assignment. GOOGLE DRIVE LEARNING CHARTS AND GRAPHS: Review the Google Charting Video at the top of the Assignment Sheet. Practice the skills as you review the video. You may also refer to this Google Learning Webpage regarding charts, as needed. For today, you should be completing the last two charts. This involves ASKING QUESTIONS of the other students in class. DO NOT BE DISRUPTIVE when you do this! ASSIGNMENT TWO- THE REALLY BIG PROJECT: BEGIN research and a 2-3 page paper regarding "The History of Your Favorite Thing," based upon your favorite thing from the chart that you made in draw.io at the start of the quarter. FOR TODAY, FIND INTERNET INFORMATION REGARDING what is happening with your company in 2019. How many products do they have? How much sales? Where are they in the marketplace? What do they do that is relevant in 2019? CONTINUE TO RECORD YOUR RESEARCH on a GOOGLE DOC, including all WEBSITE ADDRESSES! Carefully REVIEW the instructions on the Paper outline. Research your chosen "FAVORITE THING" on the internet. SAVE your research information, along with any WEBSITE information to a Google Doc called lastname_RESEARCH in your FRESHMAN_TECH folder. When you have research completed, begin writing your paper, as outlined in the assignment sheet. Call this lastname_thing_paper and make sure it is in your FRESHMAN_TECH folder. BELLRINGER: In preparation for the writing of our paper, we complete "The First Paragraph" Exercise. BELLRINGER: In preparation for the writing of our paper, please spend FIVE MINUTES at the start of class today reading this SAMPLE FAVORITE THING RESEARCH PAPER. This is an almost perfect 200/200 paper, complete with ALL elements, proper formatting and good flow. Note that this paper includes a total of ELEVEN sources. You only need to include 3. This is an example that you should attempt to emulate with your work! ASSIGNMENT ONE: All students should be working on The Google Graphing Assignment. GOOGLE DRIVE LEARNING CHARTS AND GRAPHS: Review the Google Charting Video at the top of the Assignment Sheet. Practice the skills as you review the video. You may also refer to this Google Learning Webpage regarding charts, as needed. Spend half of the time in class today working on this project. ASSIGNMENT TWO- THE REALLY BIG PROJECT: BEGIN research and a 2-3 page paper regarding "The History of Your Favorite Thing," based upon your favorite thing from the chart that you made in draw.io at the start of the quarter. FOR TODAY, FIND INTERNET INFORMATION REGARDING 2-3 CHANGES THAT HAVE OCCURRED IN YOUR COMPANY SINCE IT WAS FOUNDED. RECORD YOUR RESEARCH on a GOOGLE DOC, including all WEBSITE ADDRESSES! BELLRINGER: In preparation for our upcoming two page paper, please complete the "Plagiarism Review Form." ASSIGNMENT TWO- THE REALLY BIG PROJECT: BEGIN research and a 2-3 page paper regarding "The History of Your Favorite Thing," based upon your favorite thing from the chart that you made in draw.io at the start of the quarter. FOR TODAY, FIND INTERNET INFORMATION REGARDING THE BEGINNING OF YOUR SELECTED COMPANY. How did it start? Who was involved? RECORD YOUR RESEARCH on a GOOGLE DOC, including all WEBSITE ADDRESSES! BELLRINGER: No bellringers for today. Please work on the projects listed below, especially the GOOGLE GRAPHING PROJECT. Assignment ONE: Pencil Sketch- Favorite Things Chart. HERE IS MR. B. 's EXAMPLE. Your name will go in the center of the paper. Assignment TWO: DRAW.IO DIAGRAMS- TWO PARTS: Make sure that you save your diagrams properly, as outlined below. If your diagram is not properly saved in your FRESHMAN_TECH folder, you will receive a ZERO. 50 point assignment. 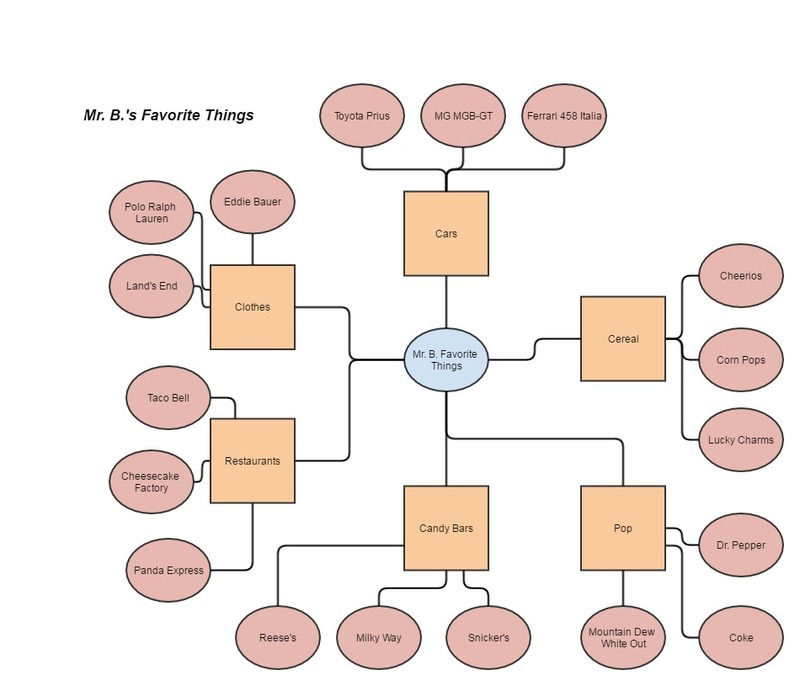 "MY FAVORITE THINGS" Chart in draw.io DIAGRAMS: To make your "Word Web" into a usable piece of information, we will be recreating your chart using draw.io DIAGRAMS. LEARNING TOOLS ARE OUTLINED BELOW. From your GOOGLE DRIVE, click on the NEW button in the upper left corner, use the pull-out menu to click on MORE, then click on draw.io DIAGRAMS. After some thinking, you will see a CREATE NEW DIAGRAM dialogue box. NAME your chart and then click CREATE. In general, this program is pretty easy to use: Simply click and drag shapes from the left to the form. Double click a shape to add words. Use the tabs on the right to add color, line style, etc. Use the CONNECTOR button at the top to create connecting lines between shapes. You can also do this automatically by clicking on connector points on your shape. MAKE SURE YOUR ARROWS ARE GOING THE PROPER DIRECTIONS IN YOUR DIAGRAM! Creating a Diagram in draw.io Diagrams. Inserting and arranging diagram elements. Using Connectors and changing shapes. Your diagrams save as you go and are already in the proper folder for grading! Assignment THREE: The Google Graphing Assignment. GRADED DURING BLOCK PERIOD NEXT WEEK. Worth 100 points. GOOGLE DRIVE LEARNING CHARTS AND GRAPHS: Review the Google Charting Video at the top of the Assignment Sheet. Practice the skills as you review the video. You may also refer to this Google Learning Webpage regarding charts, as needed. BELLRINGER: Please complete the "Research Paper Topic Selection Form" and the "Research Paper Requirements Review" Thinking Sheet. BELLRINGER: No Bellringers for today, please be working on your to-do list below! MR. B. IS IN THE HOSPITAL STILL. BELLRINGER: More understanding the subject work today! Yay! At the start of class, we reviewed some of the common CHARTS used in dispersing information. Here is a link to that Charts and Graphs Introductory slide show, including the "Money in our Pockets" Table, which you need for PROBLEM 1 of the Charting Project. Please complete "MORE GRAPHS! Thinking Sheet." MR. B. IS IN THE HOSPITAL STILL. HE HOPES TO BE HOME SOON AND COMING BACK TO SCHOOL BY WEDNESDAY, MAYBE. BELLRINGER: Complete the "Flow Charts Are Cool" Thinking Sheet." This will be a look forward to our first big assignment. We will discuss Flowcharts in more detail next week. Make sure to use CTRL+ and CRTL- to zoom in or out on the flowchart that you select! DO NOT SPEND ALL DAY GAZING AT THE FUNNY CHARTS, YOU HAVE TOO MUCH WORK TO DO! MR. B. IS OUT TODAY. HE IS VERY, VERY SICK, recovering from hospitalization due to pneumonia. He hopes to be back on MONDAY. Assignment: DRAW.IO DIAGRAMS- TWO PARTS: Make sure that you save your diagrams properly, as outlined above. If your diagram is not properly saved in your FRESHMAN_TECH folder, you will receive a ZERO. DUE MONDAY. 50 point assignment. PLEASE COMPLETE START OF THE QUARTER HOUSEKEEPING DUTIES BY FOLLOWING THE INSTRUCIONS ON THIS SHEET: The "Start of the Quarter HOUSEKEEPING DUTIES. Our First Assignment: Word Web- My Favorite Stuff. DUE TODAY. 25 point assignment. You will be using a piece of paper and a pencil to create a chart or "concept map" of information regarding some of your "Favorite Stuff." HERE IS MR. B. 's EXAMPLE. Your name will go in the center of the paper. Create at least 3 web "arms" from each of these categories and list the specific brands/ flavors, of each category that are your favorites. (such as "Snickers," "Twix," "Reese's Pieces for Candy Bars, etc." Make sure that your ARMS have arrows that move from the middle of your chart outwards, as in Mr. B. 's example. Assignment: DRAW.IO DIAGRAMS- TWO PARTS: Make sure that you save your diagrams properly, as outlined above. If your diagram is not properly saved in your FRESHMAN_TECH folder, you will receive a ZERO. DUE FRIDAY. 50 point assignment.